Pick up a bargain or a collectors classic at the used car auction. All vehicles are sold as seen. On sale today are a lively yellow Ford Zodiac and a racy red Mini, both in perfect condition. The auction is under way and the bids are rolling in… but who will take home the prize? Puzzle size 49cm x 68cm when complete. Derek Roberts was born in Birkenhead, 1945, and has had a fascination with all things mechanical from a very young age. After training at Birkenhead Art School in the 1960s he was accepted to work as a car stylist with Ford Motor Company. 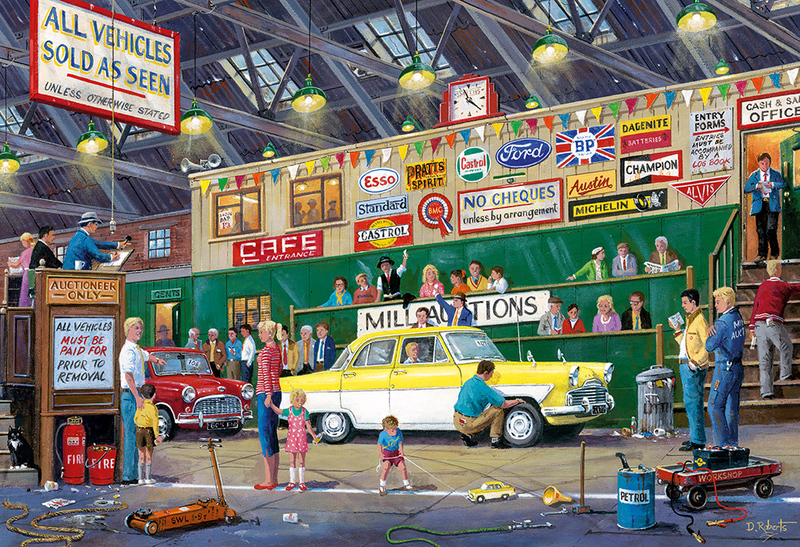 Derek specialises in nostalgic scenes depicting motorsport and vehicles from the 50s and 60s, as well as modern subjects. He also enjoys landscape painting and teaches watercolour to adult groups. Other commissions have included marine scenes for calendars and numerous commissions for private clients depicting Classic Cars, Sailing Vessels, Aircraft, Steam Loco's, Trucks and Portraits.